If you have one or more missing teeth, you may notice it can take away from the overall appearance of your smile. What you may not realize, however, is that losing teeth goes far beyond aesthetics. Not replacing missing teeth can lead to a variety of side effects that get worse with time, which is why Dr. John D. Beckwith advises patients to find a tooth replacement option that works for them. By doing so, they can slow or even eliminate the consequences of missing teeth. One of the first changes you may experience after tooth loss is gum and bone recession. This is because your teeth help stimulate your jawbone, maintaining its integrity and structure. Without the tooth root in place, the bone and gum tissue in the area start to deteriorate. Over time, this can cause the surrounding teeth to gradually shift towards the gap, which can put you at a higher risk for gum disease. This can also have an impact on your nutrition, since it can become more difficult to chew your food properly. In addition, as your jawbone continues to recede, your cheeks can develop a sunken or “hollow” appearance, giving you an aged appearance. While the effects of tooth loss can be severe, you don’t need to suffer. Dr. Beckwith and his team at Cornerstone Dental offer a tooth replacement option for virtually every need. From bridges to dental implants, Dr. Beckwith is committed to helping you regain the form and function of your missing teeth. 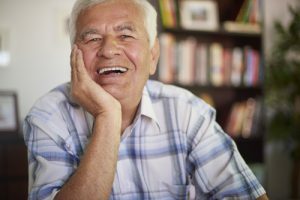 For those missing close to an entire arch of teeth, implant-supported dentures can be a life-changing solution. Unlike traditional dentures, implant-supported dentures are secured to a foundation of dental implants, which act like your natural tooth roots. This advanced option is considered one of the best teeth replacement options for patients who have missing or severely damaged teeth. As an alternative to implant dentures, which typically utilize titanium posts as their foundation, some patients may be better candidates for zirconia-based permanent teeth. This non-removable solution also replaces the full missing tooth but is composed of a ceramic-based implant instead of metal. To learn more about our other tooth replacement options, please contact our office to schedule your appointment with Dr. Beckwith.